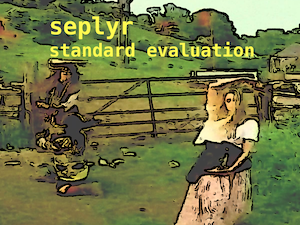 The 'seplyr' (standard evaluation plying) package supplies improved standard evaluation adapter methods for important common 'dplyr' data manipulation tasks. In addition the 'seplyr' package supplies several new "key operations bound together" methods. These include 'group_summarize()' (which combines grouping, arranging and calculation in an atomic unit), 'add_group_summaries()' (which joins grouped summaries into a 'data.frame' in a well documented manner), 'add_group_indices()' (which adds per-group identifiers to a 'data.frame' without depending on row-order), 'partition_mutate_qt()' (which optimizes mutate sequences), and 'if_else_device()' (which simulates per-row if-else blocks in expression sequences). # supplied by a user, function argument, or control file. Please see help("%.>%", package="wrapr") for details on "dot pipe." Note: seplyr is meant only for "tame names", that is: variables and column names that are also valid simple (without quotes) R variables names. fix non-grouped xes of group_summarize(). warnings on mutate(), summarize(), and transmute(). Switch from parse_quosure() to parse_quo() ( https://github.com/WinVector/seplyr/issues/3 ). special-case empty grouping and arranging. check more about arguments in arrange_se(). add .by_group argument to arrange_se(). Fix NSE interface to gather()/spread(). complete_se() from Richard Layton graphdr. Switch to qae() (need wrapr 1.2.0 or newer version). Avoid possible rlang/dplyr issue in rename vignette https://github.com/r-lib/rlang/issues/411 . Fix misspelling of package import. Fix missed case in statement partitioner. Fix deprecations and visibility of stringAlgebra. Start to relax quoting conditions. partition on re-assignment (if_else_device does this, but includes a re-use so was okay). Move to wrapr 1.0.2 (pick up qae() and qe()). add wrapr dependency (for named map builder, and lambda abstraction). finish string algebra and add more *_nse() methods. Implicit paste() in some cases. Replace rlang::parse_expr() with rlang::parse_quosure() to get explicit environment control. add many more adapter fns.